Fill in your details below and we will let you know within 24 hours if we can get Geek Out! TableTop Limited Edition to you with haste! Geek Out! is the outrageous game that finds out once and for all which player is the most knowledgeable about your favorite pop culture subjects! In the game, you will draw cards asking you to list things which fall under a certain category. Before you begin, however, the other players may try to steal your points (and bragging rights! ), by bidding to list even more than the card requires. The bidding continues until one player is ready to “out-geek” their friends. 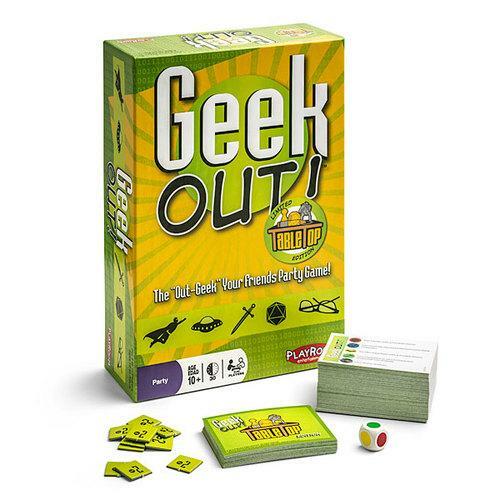 Will you Geek Out!™ over comic books, fantasy, games, science fiction and more? The Geek Out! TableTop edition takes the game to the next level and finds out once and for all which player is the most knowledgeable about your favorite geeky pop culture subjects! This Limited Edition includes a bonus deck with additional lists.